Giplet is a simple GNOME panel applet that displays your computer’s ip address. Giplet can either display the ip address of a specified ethernet interface or the ip address the outside world sees. It can also be set to recheck every so often in case your router resets or the ip address is renewed. Giplet is available in Ubuntu official repository, search and install it in Ubuntu Software Center. After that, right-click on panel and select “Add to Panel…” choose the applet to show your IP address. 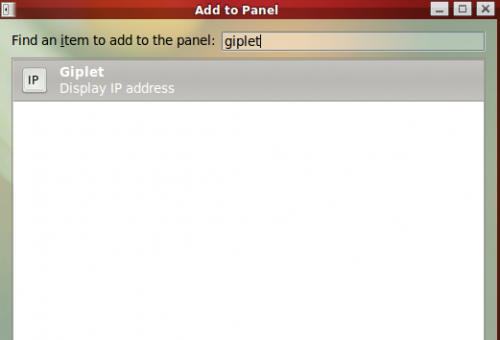 1 user responded in " Giplet – Simple Gnome Applet to show IP address on Panel "
Nice thanks so the ip addy that shows is the one every one else can see also.